One of the best things about watching Texas Hold 'Em poker on TV is the ability to see each player's hand. While seeing everyone's cards may put a feeling of confidence into most players watching the game, once you sit in the player's seat for yourself, the feeling changes. No longer able to read the table odds in the corner of the screen, you're left to fend for yourself against players who have real experience reading tells and doing complex math in their head on the fly. 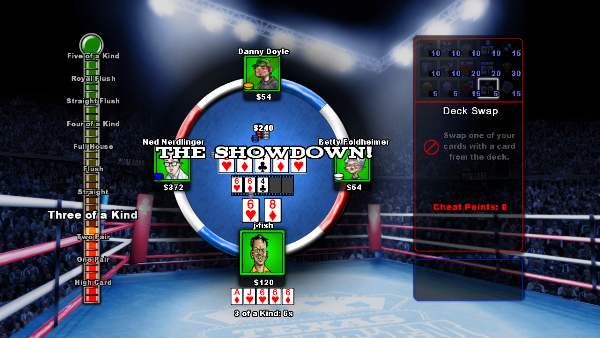 While the real game's difficulty is enough to keep most people from playing the game for themselves, the game's television popularity is anything but stagnant, inspiring D3 to release Texas Cheat 'Em on the PSN, allowing players to take part in the incredibly popular card game, but retain the same all-knowing abilities from the television show. 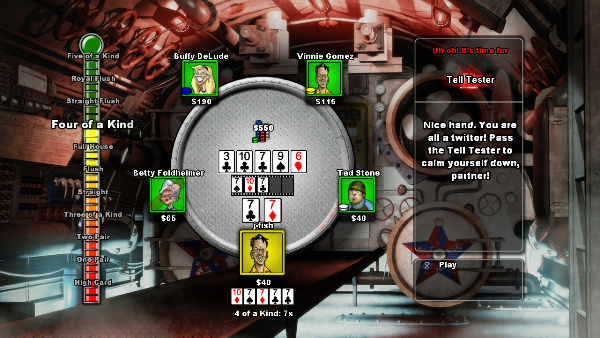 A quick rundown for those unfamiliar with the card game: Each player starts out each hand with two hole cards. After the first round of betting (during which a player can either call the minimum bet, raise to a higher bet, or check if no bet has been placed), three community cards known as the Flop are placed in the middle of the table. Another round of betting ensues, followed by a fourth community card, the Turn, another round of betting, and finally the fifth community card, the River, and one final round of betting. The object of the game is to make the best five-card hand possible out of the seven cards available to you. 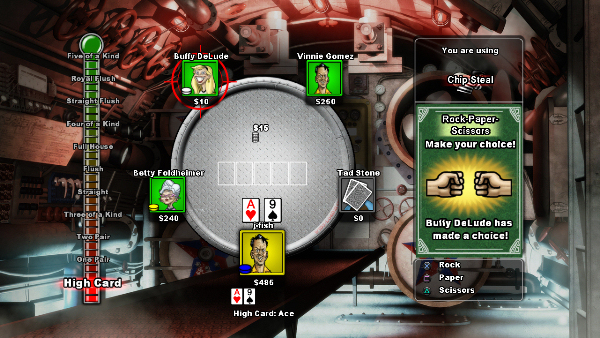 Since each player has two cards for themselves, players must try to read others' reactions to the community cards, along with factoring in the odds that a card they need to make a better hand is still in the deck in order to determine whether or not they should call, raise, or fold their hand. Texas Cheat 'Em takes the entire challenge away from this system by presenting you with a large selection of cheats, that are accomplished mid-hand after you successfully complete one of several casino-themed mini-games like a slot machine (where you are told what shape to aim for), a roulette wheel (press X to stop the wheel on a certain wedge), a strength test (press X when the power bar is fullest), and so on. Cheats come in various forms, and each cost a different amount of Cheat Points to pull off. At the beginning of each round of betting your cheat points are renewed and you can choose from cheats that allow you to change the value of one of your hole cards or one of the community cards, change the value of an opponent's hole card, lock in the cards in the community (so that other players can't change the card values), and even steal chips from another player. While these cheats do give you a sizeable advantage over other players (regardless of the fact that they can all cheat too), the "Precognition" cheat, which allows you to view all five community cards before they are dealt, allows you to fairly consistently blow every other player out of the proverbial water, by giving you so much information so early in the hand, that you can spend every other moment working towards the absolute best hand possible. If you play your cards right (no pun intended), you can guarantee yourself a win in every hand long before the fifth card has ever been played. 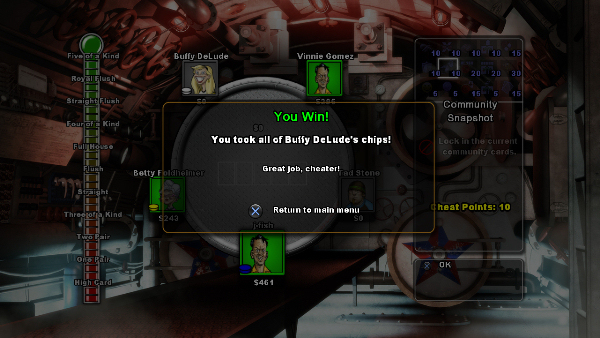 To keep each hand from playing the same as the one before, the game's career mode gives you particular goals to reach, with goals coming in the form of defeating a particular player one-on-one, earning a certain amount of chips in a limited number of hands, stealing all of a player's chips, and so on. All of this cheating creates a definite ease within the title, as it is possible to win almost every hand with little effort, with the vast majority of the game's trophies being unlocked by simply playing the game. But while it may be easy to pull one over on multiple AI characters, once you start playing online, the challenge (and frenzy) of the title are kicked up a notch. Up to eight players can enter a hand at once, forcing you to constantly keep an eye on the community cards, as they can rapidly change, eliminating whatever strategy you may have set up for yourself, that is, unless you use the cheat that locks the cards values in place. The question is, can you perform your cheat before someone else performs there's? Actually the question should really be, can you actually find other human players who will be able to stare at the graphical mess before them long enough to actually play a hand? Even after accepting the fact that the font in most next-gen titles is going to be microscopic when displayed on anything but a massive screen, that same understanding doesn't carry over into grainy textures, nondescript environments, and an overall cluttered playing field that adds a learning curve to a title that shouldn't be that difficult to comprehend, especially for those familiar with the original version of Texas Hold 'Em. To put the overall look and feel of the game into perspective, imagine playing an intricate title on the small screen of a Nintendo DS, but with the original Playstation's graphics. While the gameplay is sound, the graphics are anything but, and the sound department fares no better, with entirely commonplace sound effects for chips or cards being played, and a lackluster sound track to complete the package. Where the cheats within the game are appreciated and offer a unique take on the established genre, the game is rather boring and altogether far from extraordinary, especially where the technical sides of things are concerned. If you are a die-hard fan of Texas Hold 'Em who has always wished for the ability to stab other players in the back this is a worthwhile option, but is fairly uninviting for anyone else. Special thanks to David Saba and D3 for prodiving a copy of this title.